Get your ZTE Grand X2 L (V969) 5.5-inch quad-core phone today at Php 1,999! ZTE Grand X2 L V969 will get a jaw-dropping price-drop today, October 28, from Php 11,990 to a rock-bottom Php 1,999 between 2:00PM until 6:00PM. Get this 5.5-inch smartphone at the meager price of a feature phone with this one of a kind limited time offer from ZTE Mobile. The device will be available to selected ZTE kiosk or concept store. 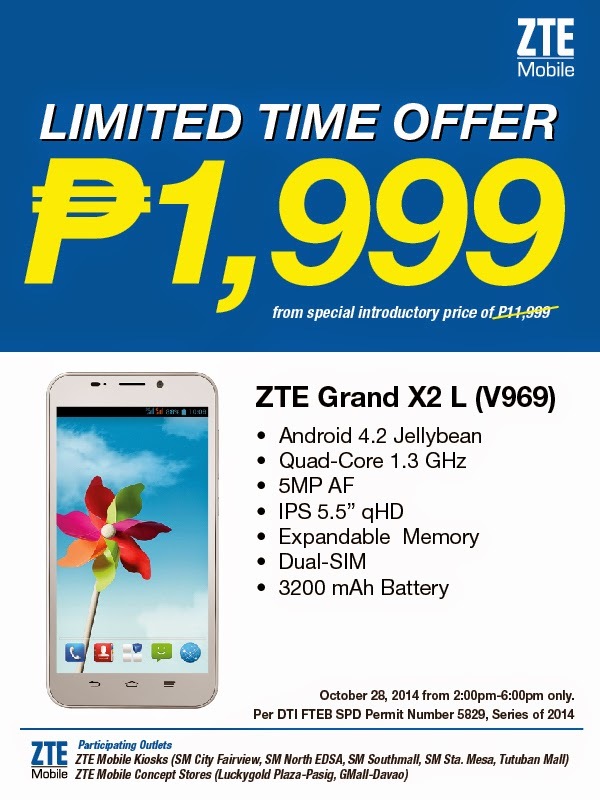 Get the ZTE Grand X2 L for only 1999, that is 10,000-peso price-slash off the original price of Php 11990! Grand X2 L features a 5.5-inch qHD IPS display and makes multitasking easy with its 1.3 GHz MediaTek MTK6582 quad-core processor complemented by 1 GB of RAM. Its 5 MP main camera snaps decent photos and 720p video at up to 30fps in good lighting while the VGA front camera performs well at video calls. It runs on dual-SIM standby, supporting 3G and HSPA networks. Avail of ZTE Grand X2 L for only 1,999 pesos from ZTE Mobile Kiosks located in SM City Fairview, SM North EDSA (annex), SM Southmall, SM Sta. Mesa, Tutuban Mall and the ZTE Mobile Concept Store in GMall, Davao. You may also call MSI-ECS Philippines, the exclusive distributor of ZTE mobile products in the country, at 688-3180 or email marketing@msi-ecs.com.ph for more details. Pinoy Metro Geek: Get your ZTE Grand X2 L (V969) 5.5-inch quad-core phone today at Php 1,999!